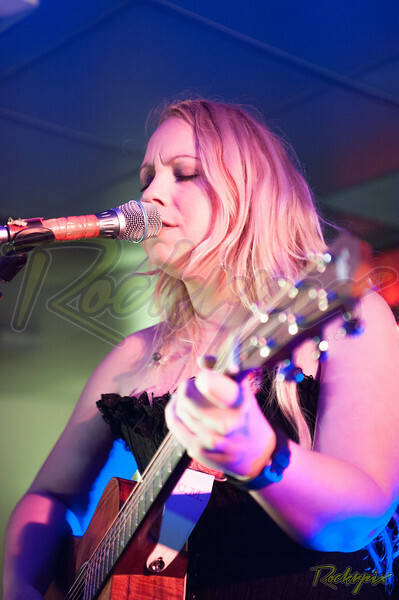 Chantel took to the stage to play an opening solo acoustic set of five songs that came as a real surprise and a veritable treat. Brave move to open with a cover of the masterful Joe Bonamassa’s Mountain Time but carried off with élan, the handwork across the strings intricate and deeply melodic just how it should be. If that was all about the guitar an evocative and haunting version of Stevie Nicks’ Gold Dust Woman was all about the vocal, hushed words pulled from deep inside floating out on the carpet of acoustic sounds. And then the simply beautiful delicacy of Home a completely new song, my first time of hearing and one I will want to hear again and again. Chantel a study in deep emotion as the words fell from her lips, the feel etched on her features. Now Chantel is diminutive in stature but everything else about the lady is big and bold and the plugged in set that followed proved this beyond a shadow of a doubt, Chantel being joined by powerhouse drummer Keith McPartling and Colin Sutton the groove master on bass. I have seen Chantel a number of times now and she always entertains but it is clear there is greater maturity to her voice, her guitar playing is perhaps a little more restrained but better for it, almost teasing us leaving us wanting more from her impressive solos. Having a bunch of new songs from soon to be released second album allowed Chantel to flesh out the set list and demonstrate how far her song writing has developed since the debut. The new tunes showcased tonight combined delicacy as per Home while others emitted a harder rockier sound. Familiar territory for second set opener however, on the punchy hooky grooves of Caught Out leading very neatly in to the brand new power drive of Burn Your Anger. Fiery riffs slammed over a deep groove and a rasping angry vocal all setting a great pace. A step off the gas and down shift through the gears for the funky vibe of Like No Other, low slow rhythm section runs building the platform from some serious chops from Chantel and a soul driven vocal. An audacious cover of Robin Trower’s Daydream was an absolute standout moment, a favourite of the band and crowd and tonight stretched in to a ten minute plus trippy psychedelic sonic landscape. Sutton and McPartling in step, pumping out a rhythm that rose and fell in line with Chantel’s histrionics with the guitar. Intricately weaved note runs ushered in the vocal and likewise the scintillating solo that dominated the middle section of the song. McGregor using her effects board to full effect hitting the wah wah pedal for the distortion and a number of buttons for some heavy sustain. A classic song delivered in a unique style by McGregor and co. Delving back in to the debut album for I’m No Good For You brought the show to a fitting climax, if the opening section was faithful to the original what followed tore up the template and Chantel punched out the licks and this time Sutton hit the effects pedal to thump out a grinding series of bass lines that boomed out over the crowd.